The Little Mermaid in Copenhagen. 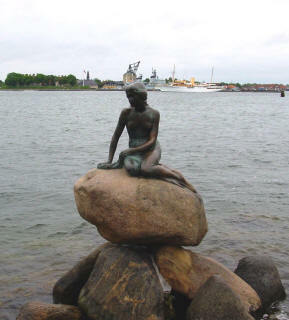 The statue of the Little Mermaid sitting on a granite stone at Langelinie Pier in Copenhagen. This small and unimposing statue is a symbol of Copenhagen, and is one of Denmark's biggest tourist attractions. The sculpture was put up in 1913. "The Little mermaid" was commissioned in 1909 by Carl Jacobsen, who was a son of the founder of Carlsberg. The statue was made by sculptor Edvard Eriksen 1876-1959 and his wife Eline 1881 -1963 was model. The Little Mermaid statue was In 1909 a present from brewer Carl Jacobsen (The Carlsberg Breweries) to the city of Copenhagen. He presented her to the city of Copenhagen on August 23, 1913. The Little Mermaid (Den lille Havfrue) is a fairytale written in 1836 and first published in 1837 by the danish author Hans Christian Andersen (H.C.Andersen). The story is about a young mermaid who is willing to give up everything to gain an immortal soul and the love of a prince.